When it comes to finding a place to park its spacecrafts, NASA doesn't just drive around waiting for someone close to the building to pull out of their spot. For the upcoming rover mission to Mars in 2020, the space agency has announced that it will be landing in a 28-mile-wide crater believed to have been formed over 3.6 billion years ago. Named the Jezero Crater after a town in Bosnia (translates to "lake" in English), the location was chosen over more than 60 other candidates because of its potential for scientific study and the diversity of rocks that may hold traces of past microbial life. 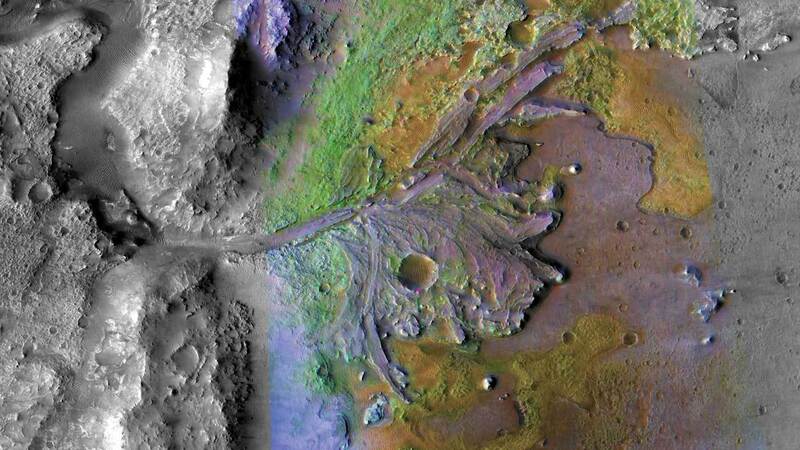 "The landing site in Jezero Crater offers geologically rich terrain, with landforms reaching as far back as 3.6 billion years old, that could potentially answer important questions in planetary evolution and astrobiology," said Thomas Zurbuchen of NASA's Science Directorate. "Getting samples from this unique area will revolutionize how we think about Mars and its ability to harbor life." According to NASA, the Jezero Crater was once a river delta. Billions of years later, it's possible that those carved water channels still contain evidence of life on the Red Planet as well as interesting minerals and sediments that were carried there long ago. The crater itself is rocky in places and filled with depressions in others which will make the landing process challenging, but NASA believes that the risk is worth the scientific reward. "The Mars community has long coveted the scientific value of sites such as Jezero Crater, and a previous mission contemplated going there, but the challenges with safely landing were considered prohibitive," said Mars 2020 project scientist Ken Farley in a statement. "But what was once out of reach is now conceivable, thanks to the 2020 engineering team and advances in Mars entry, descent and landing technologies."